It is from this action of Abraham that the concept of "tithing“ or giving 1/10th of one’s income or wealth to God (i.e., for religious purposes) originates. Obviously this great priest-king Melchizedek was highly honored by Abraham. Who was he? Very little is known about him, but references to him and to what he was can be found in the New Testament as well, specifically in The Epistle of Paul to The Hebrews. "If therefore perfection were by the Levitical priesthood... what further need was there that another priest should rise after the Order of Melchizedek, and not be called after the Order of Aaron?... For it is evident that Our Lord sprang out of Judah; of which tribe Moses spake nothing regarding priesthood. Clearly these passages indicate the existence of a Son of God - an Avatar - that predates the arrival of Jesus Christ with Whom the patriarch of the Jews had contact. It is also interesting to note that the Epistle is directed not just to the tribe of Judah, but to all of the Hebrews or sons of Abraham. Considering the mounting evidence that testifies to the link between India and the forefathers of the Hebrews, and also considering the abundant evidence that Abraham himself came from the Kashmir Mountains in the North of India as well, it has been suggested that the great Priest-King Melchizedek - this Son of God of the period of Abraham - was not from the Middle East at all, but was located in India itself. Abraham was born somewhere around 2000 B.C., although many theologians and scholars have put his date of birth earlier by at least a few hundred years (i.e., 2500 B.C.) After Abraham left Haran (India) and after his arrival in the Palestine area, The Bible records a great Battle of the Kings. Initially Chedarlaomer, the wicked king of Elam (Elam was an area located east of Mesopotamia or the Iraq/Western Iran area; i.e., the area of Eastern Persia and what was the Northwestern section of ancient India) along with some compatriots wage war with five other kings, defeating them in the process. Thence onward, for 12 years, these five defeated kings have to do the bidding of Chedarlaomer. But during the 13th year, the five kings rebel, and during the 14th year, the great Battle of the Kings occurs. It is after the slaughter of the kings (which Abraham takes part in) during which the evil king and his allies are defeated and killed, that Abraham is met and blessed by the priest-king Melchizedek. A parallel to this story in The Bible can be found in what could be called the Hindu Bible - The Mahabarat. In The Mahabharat and evil king, along with his allies, defeats (through deception) five other kings who are then sent into exile for 12 years. On the 13th year, the five kings go "incognito“ so the evil king cannot find them. And during the 14th year, a great war takes place - a Battle of the Kings - where kings and their armies are slaughtered in great numbers, the battle taking place in Kurukshetra in Northwest India. This great slaughter or war of the kings is said to have taken place around 2000 to 2500 B.C. or so. Further, there indeed was a Son-of-God, an Avatar, on Earth at that time Who was also a King; i.e., Lord Krishna, said to be the Poorna Avatar - the Full Avatar of the Unmanifest Lord Himself. In addition, prior to the outbreak of the war, Lord Krishna went as a Peace Messenger to the evil king to persuade him not to go to battle, and to return all the property and goods he had taken from the five other kings. 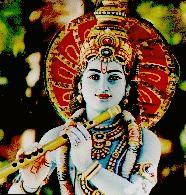 He came as an envoy of Peace and the King of Dharma or Righteousness. But the evil king, puffed with pride and ego would not listen. Hence the battle took place. In fact the very concept of the Messiah, the Christ, the Son of God appears to have ist roots in India with this idea of God incarnating in Human Form to be found in the earliest Holy Scriptures know to man, The Upanishads. According to several scholars (including Rudolph Otto and Dr. Radhakrishnan), while references to the Messiah are sprinkled throughout the Old Testament, one of the most vivid descriptions of Him - including the varous titles He will bear - is to be found in The Dead Sea Scrolls in The Book of Enoch (written approximately 80 B.C. ), where the entire process of His Spiritual Ascent to God in Heaven is recounted. This process of spiritual ascent, etc. is found in India in The Kaushitaki Upanishad which was composed long before The Book of Enoch or any other scripture of Israelite or Jewish origing. From: Rejoice! The Scriptures Are Fulfilled! The Phoenix Has Come! By: Kristina Gale-Kumar, Cardinal Enterprises, P.O. Box 1363, Hilo, Hawaii 96721-1363. ISBN 0-9611204-7-9.